It’s mid-December and some areas of the country have already had heavy snowfalls. Winter storms can have a serious economic impact with disruption of business and travel, collapsed roofs and stresses on municipal governments. 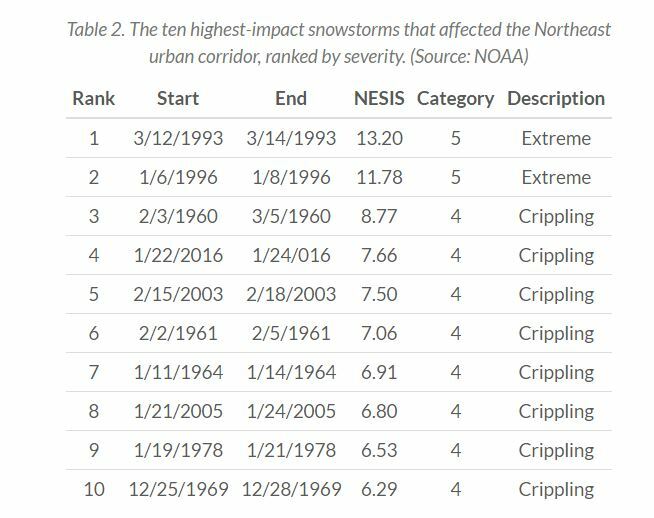 It’s useful to know the relative impact of winter storms, and in a recent blog post, AIR Worldwide spotlights a rating scale called Northeast Snowfall Impact Scale (NESIS), developed by the Weather Channel and the National Weather Service. 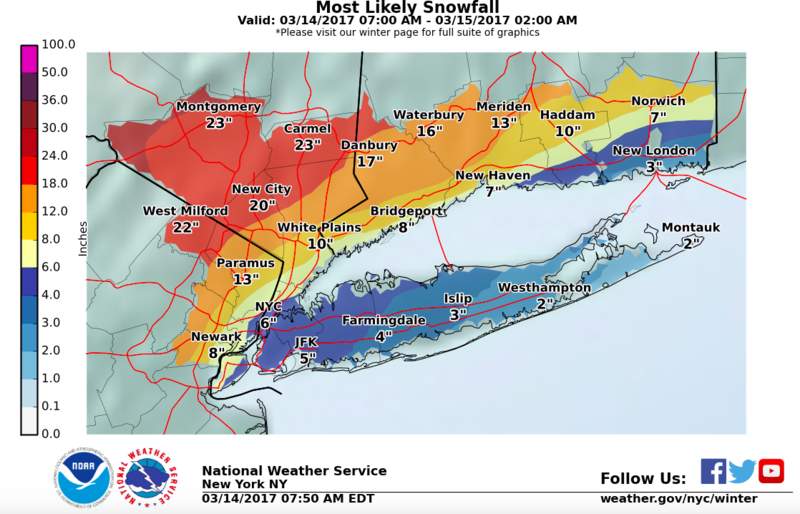 NESIS provides a relative measure of Northeast winter storm impact based on total snowfall amount, geographic distribution, and population density. The scale does not consider the replacement value of property, however. The I.I.I. has a Facts & Stats about Winter Storms here. While major cities in the Northeast may have been spared blizzard conditions, a strong winter storm is still unfolding and inland areas are watching the snow pile up. Vehicle crashes between two or more drivers caused by snowy and slippery roads are covered by liability insurance, which is required by most states. A car that crashes into an object would generally be covered under the optional collision portion of an auto policy. Physical damage to a vehicle caused by heavy wind, flooding or fallen ice or tree limbs is covered under the optional comprehensive portion of an auto policy. Damage to the house and its contents caused by weight of snow or ice that creates a collapse is covered. Additional living expenses (ALE)—in the event that a home is severely damaged by an insured disaster. This would pay for reasonable expenses incurred by living elsewhere while the home is being fixed. Damage caused by flooding is not covered by standard homeowners or renters insurance policies. Melting snow that seeps into a home from the ground up would be covered by flood insurance, which is provided by FEMA’s National Flood Insurance Program, and a few private insurers. Flood insurance is available to both homeowners and renters. Ready For First Flakes In Northeast Blizzard? A strong nor’easter will cause a late season winter storm stretching from the central Appalachians to New England, with impacts for many of the big cities in the Northeast like New York City, Boston, Philadelphia. Widespread winter storm warnings are now in effect for heavy snow accumulations. 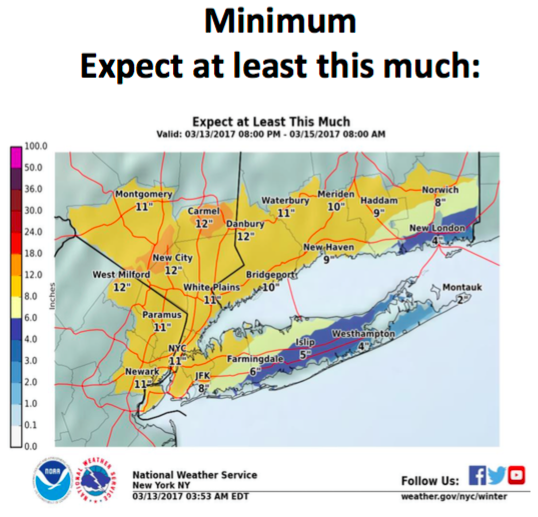 Blizzard conditions are expected for the NY/NJ metro areas, in addition to damaging wind gusts and coastal flooding, per NWS New York. The New York State Emergency Operations Center is activated with stockpiles of sandbags, generators, pumps and vehicles on standby. New York City’s Department of Sanitation is pre-deploying 689 salt spreaders across the five boroughs. PlowNYC is activated (where you can track the progress of city spreaders/plow vehicles) and more than 1,600 plows will be dispatched when more than 2 inches of snow accumulates. New York City Transit will monitor conditions for subways and buses via its Incident Command Center situation room, with 13,000 personnel on duty for subways during the storm, including more than 9,700 snow-fighting personnel. Port Authority of New York and New Jersey has hundreds of pieces of snow equipment at the airports, including melters able to liquefy up to 500 tons of snow an hour and plows that can clear snow at 40 mph. And insurers, too, are well-prepared and ready to respond to the needs of their policyholders. Are you prepared? Check out Insurance Information Institute facts and statistics: winter storms and winter weather preparation tips. 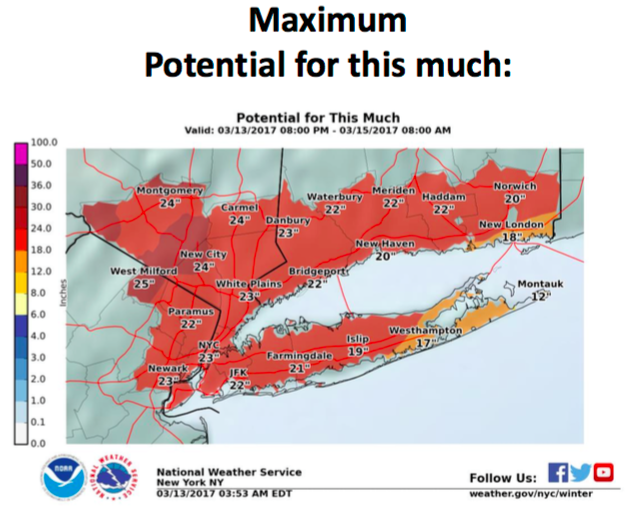 As some parts of the Northeast experience their first frost/freeze of the season, this is a good time to make some cold weather preparations. 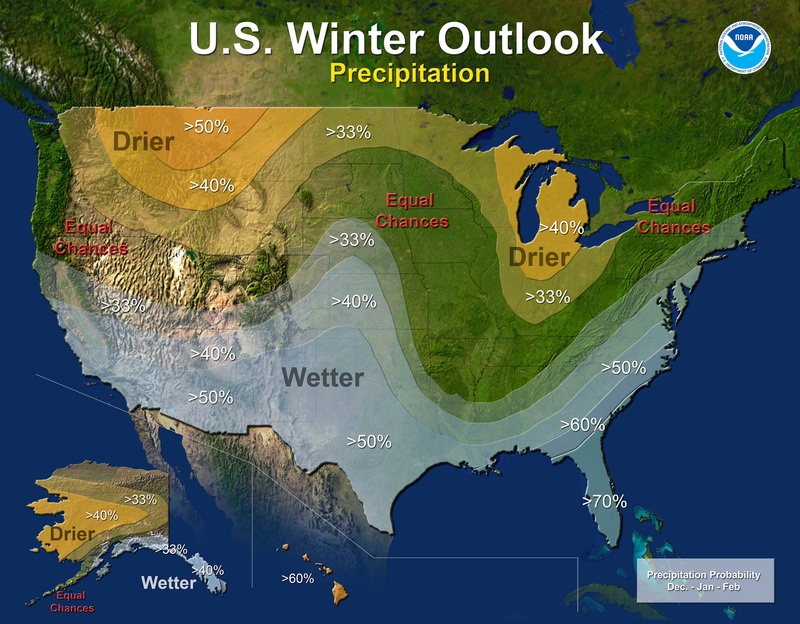 NOAA’s recently issued U.S. Winter Outlook said the development of La Niña, the climate phenomenon and counterpart of El Niño, is expected to influence winter conditions this year. 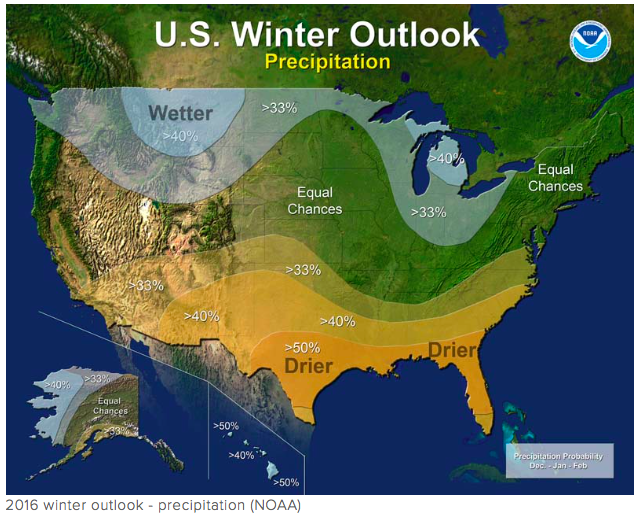 La Niña favors drier, warmer winters in the southern U.S. and wetter, cooler conditions in the northern U.S. but because forecasters expect it to be weak and short-lived, we probably shouldn’t bet against snow. Other factors that often play a role in the winter weather include the Arctic Oscillation, which influences the number of arctic air masses that penetrate into the South and create nor’easters on the East Coast, and the Madden-Julian Oscillation, which can affect the number of heavy rain events in the Pacific Northwest. NOAA explains that its seasonal outlook does not project where and when snowstorms may hit or provide total seasonal snowfall accumulations. The Insurance Institute for Business and Home Safety has resources on how to protect homes and businesses from winter weather damage here. Winter storms are historically very expensive for insurers, and the third-largest cause of catastrophe losses, behind hurricanes and tornadoes, the Insurance Information Institute reports. Winter storms caused an estimated $3.5 billion in insured losses in 2015, up from $2.6 billion in 2014, according to Munich Re. Five of the seven individual billion-dollar insured loss natural disaster events in 2015 were recorded in the United States, according to Aon Benfield’s Annual Global Climate and Catastrophe Report. The other two billion dollar events were recorded in Europe. All of the events were weather-related and below the average of eight. The five events in the U.S. were equal to the 2000-2014 average. Italy’s May 2012 earthquake was the last non-weather billion-dollar insured loss event. The all-time record of 17 billion-dollar weather events was set in 2011. The costliest individual insured loss event of the year was a prolonged stretch of heavy snow, freezing rain, ice, and frigid cold that impacted much of the eastern United States in February 2015. That event prompted an estimated $2.1 billion insured loss. Other billion-dollar insured loss events in the U.S. included a severe thunderstorm outbreak in the U.S. in May and severe thunderstorms and flooding in December. Each of these events cost an estimated $1.4 billion in insured losses. Another thunderstorm event in the U.S. in April cost $1.2 billion, while the yearlong drought in the West was another $1 billion insured loss event. The two non-U.S. billion dollar insured loss events of 2015 consisted of the catastrophic December flooding in the UK that cost an estimated $1.3 billion, and European windstorms Mike and Niklas in March and April which resulted in an estimated insured loss of $1 billion. Aon Benfield noted that on a global scale disasters caused insured losses of $35 billion in 2015, below the 15-year mean of $51 billion and 14 percent lower than the median ($40 billion). This was the fourth consecutive year with declining catastrophe losses since the record-setting year in 2011. The U.S. accounted for 60 percent of global insured disaster losses in 2015, reflecting the high rate of insurance penetration in the country, according to the report. I.I.I. facts and statistics on U.S. catastrophes are available here. Those of us in the Northeast still thawing out from the last two winters will be relieved to hear that this year’s winter is likely to bring warmer and wetter conditions thanks to El NiÃ±o. 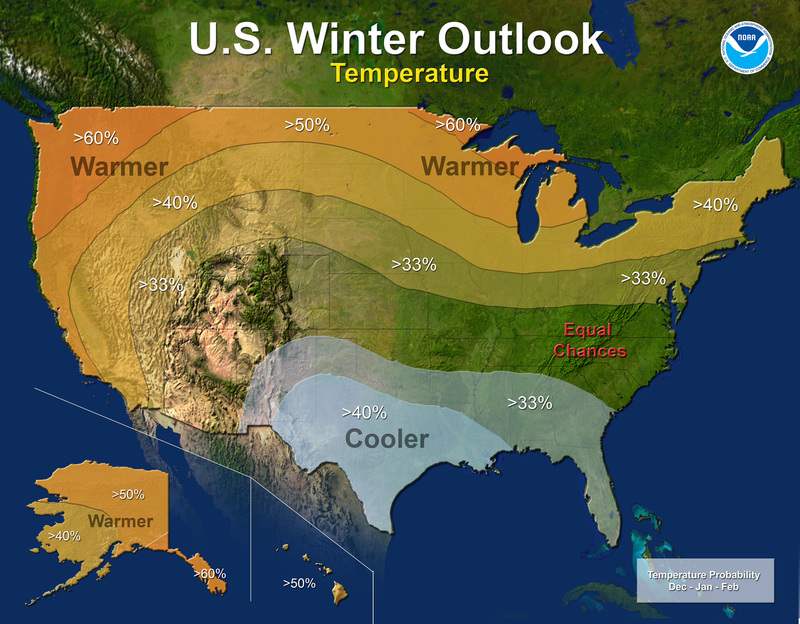 NOAA’s just-released 2015 U.S. Winter Outlook (December through February) calls for cooler and wetter weather in the South, and above-average temperatures in the West and across most of the Northern tier states. That’s not to say there won’t be snow. NOAA says this year’s El NiÃ±o, among the strongest on record, is expected to influence weather and climate patterns this winter by impacting the position of the Pacific jet stream. Other factors that can play a role in the winter weather NOAA says include the Arctic Oscillation, which influences the number of arctic air masses that penetrate into the South and nor’easters on the East Coast, and the Madden-Julian Oscillation, which can impact the number of heavy rain storms in the Pacific Northwest. Winter storms are historically very expensive for insurers, and the third-largest cause of catastrophe losses, behind hurricanes and tornadoes. Check out the I.I.I.’s insurance-related facts and statistics on winter storms here. Weather forecasts have improved dramatically in the past generation, but this storm was odd. Usually a blizzard is huge. On a weather map, it looks like a big bear lurching toward a city. This storm was relatively small but intense where it struck. On a map, it looked like a balloon, and the forecasters’ job was to figure out where the balloon would pop. They were 75 miles off. It turned out they over-relied on a model — the European model, which had served them well forecasting superstorm Sandy, according to this NorthJersey.com post mortem. – Models aren’t perfect. Actuaries, like weather forecasters, have multiple forecasting models. Like forecasters, actuaries have to know the pros and cons of each model and how much to rely on each one given the circumstances. Actuaries and forecasters both bake their own experience into their final predictions. Property catastrophe models are considerably cruder than the typical weather forecasting model. By crude I mean less accurate. Cat models project extreme events, where data are sparse and everything that happens has an oversize influence on everything else that is happening. Woe to the insurer that over-relies on cat models, something cat modelers themselves say regularly. – It’s hard to pick up the flag once you have planted it. Forecasters suspected late Monday that New York City would be spared the brunt of the storm, but acknowledge now they were reluctant to make too big a change because it could hurt their credibility, particularly if the new forecast had proved too mild. This is a human failing both by the forecaster and its recipient, both of whom worry about crying wolf. The tendency also helps explain why it is hard to project market turns, whether they are from growth to recession or from rising insurance rates to falling. – Policymakers have egg on their faces today, but they appear to have been following sound risk management principles. It’s not unusual to prepare for disasters that don’t happen, something to think about next time you unbuckle a seatbelt or unlock a door. The scale this week was much larger, but the principle was the same. Needlessly closing a subway is better than stranding hundreds on it, and the occasional forecaster’s error is certainly better than the crude prognostication that gave us the Galveston hurricane or the Schoolchildren’s Blizzard. I.I.I. has Facts and Statistics about U.S. catastrophes in general and winter storms in particular. With frigid temperatures and snow expected to fall around the New York City area and other parts of the United States this week, it’s a good time to review how winter storms can impact catastrophe losses. For insurers, winter storms are historically very expensive and the third-largest cause of catastrophe losses, behind only hurricanes and tornadoes, according to the I.I.I. 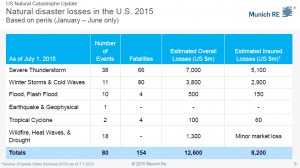 Despite below average catastrophe losses overall in 2014, insured losses from winter storms were significant. 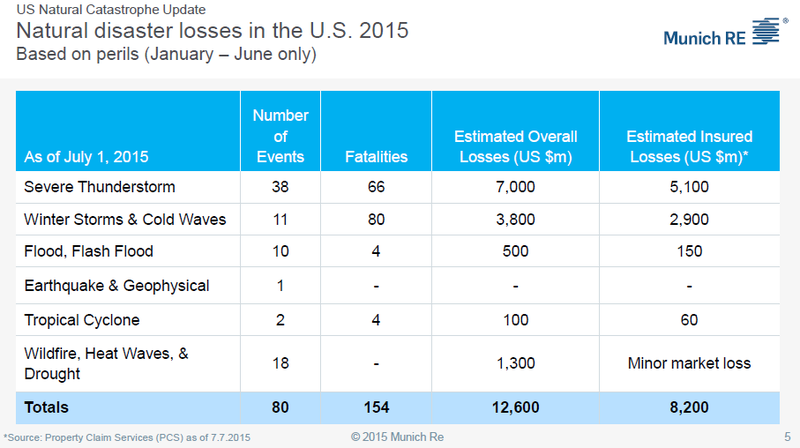 In fact winter storms in the U.S. and Japan accounted for two of the most costly insured catastrophe losses in 2014. According to preliminary estimates from sigma, extreme winter storms in the U.S. at the beginning of 2014 caused insured losses of $1.7 billion, above the average full-year winter storm loss number of $1.1 billion of the previous 10 years. And Aon Benfield’s 2015 Reinsurance Market Outlook notes that a multi-billion-dollar February winter weather insured loss event in Japan was one of the costliest ever for the country’s industry. 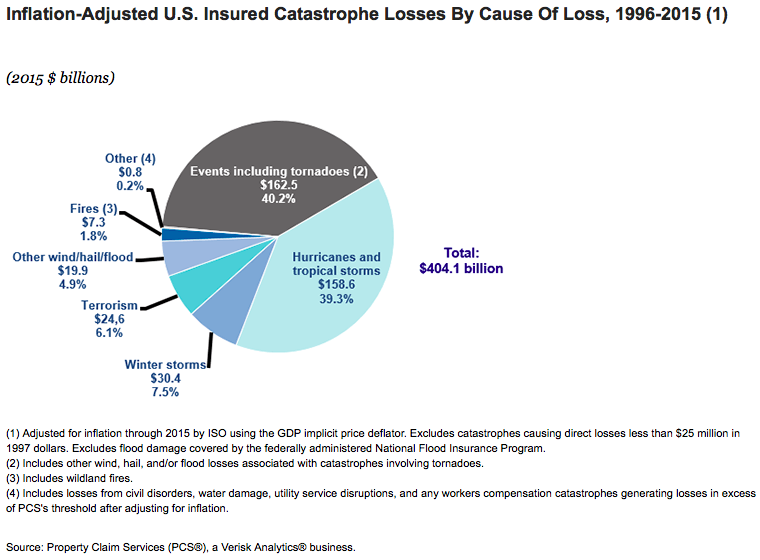 Sigma estimates the insured loss payout from that Japan winter storm at $2.5 billion and ranks it as the third costliest insured catastrophe loss of 2014. What about the year prior? Winter storms caused $1.9 billion in insured losses in 2013, up dramatically from $38 million in 2012, according to reports from Munich Re. From 1994 to 2013 winter storms resulted in about $27 billion in insured catastrophe losses (in 2013 dollars), or more than $1 billion a year on average, according to Property Claim Services (PCS). The good news is that NOAA’s U.S. Winter Outlook predicted early on that a repeat of last year’s winter of record cold and snow is unlikely.